Four years after the Yemeni Revolution, what are the prospects for another democratic movement? Messages like this have become commonplace, along with the accompanying rage. How is it possible that within five years, we have gone from an impressive revolutionary push with a broad base in Yemeni society, to Saudi Arabian fighter jets bombing large parts of the country as the Houthis consolidate power? Due to Yemen’s marginalization — it is the poorest country in the Arab world — there are now few dependable Anglophone specialists on the country. After the decline of revolutionary governments during the Cold War, there have been too few geostrategic interests to attract Western interest. As a result, there are now few non-military experts with enough knowledge about the country to speak about it confidently. Q: What can you tell us about the Houthis? A: The Houthis are an alliance of tribal militants based in Sa’ada, which is a governorate in northern Yemen. Mainstream analysts insist that they are nothing more than an Iranian proxy. However, the story is more complicated. It is widely believed that deposed president Ali Abdullah Saleh was threatened by the broad religious and tribal support behind Hussein Badreddin al-Houthi, the leader of the Houthis’s predecessor organization, the Believing Youth. The Youth began operating in the early 1990s, and were mostly concerned with Zaidi Shi’i educational and cultural revival projects. However, Saleh was concerned al-Houthi would claim to be a new Zaidi Shi’i Imam and lead a tribal revolution from northern Yemen. The Youth at the Great Mosque of Sana’a organized demonstrations on June 18, 2004, in reaction to the US invasion of Iraq and Israeli repression of the Al-Aqsa Intifada. The demonstrations were part of a larger Yemeni protest wave. In response, Saleh’s forces attacked. They killed large numbers of al-Houthi’s followers, offered a bounty for his capture, and launched major combat operations in northern Yemen. But the strategy backfired. Al-Houthi was killed by September 2004, and his supporters organized around his brothers. The group was named “the Houthis” to memorialize him. It quickly became an armed insurgency, and engaged in a prolonged conflict known as the Sa’ada Wars. Eventually, it participated in what became known as the 2011 Yemeni Revolution — part of the Arab Spring. It was amid the failure of the post-insurrectionist government set up around Saleh’s former vice president, Abd Rabbuh Mansur Hadi, one heavily supported (and effectively installed) by the United States and Saudi Arabia, that the Houthis seized power. Hadi’s government had multiple issues: a lack of democratic legitimacy, an inability to quickly meet the material demands of the uprising, and a National Dialogue Conference (NDC) that failed to build a proper democratic framework. The Houthis maintain that they seek to implement the NDC’s provisions in a new government. Q: But is Iran backing the Houthis? A: It’s not that simple. It appears that the Houthis have expanded ties with Iran. However, this seems to have happened quite recently. Such ties certainly don’t explain the Houthis’s success in taking control over much of the country, which was a result of a bizarre alliance with Saleh, and access to his loyalists and military resources. The widespread myth is that the Houthis are a “Yemeni Hizb’Allah,” and this simply isn’t true. The Houthis still get many of their weapons from these sources, despite possible Iranian backing. The brutal irony is that many of the Houthis’s weapons were manufactured in Europe and the United States in the first place. Iran could well be backing the Houthis. But it is the proliferation of Euro-American military goods in the Middle Eastern black market, as well as official sales to the Yemeni military, that accounts for much of the group’s current arsenal. In fact, to the extent that Iran is assisting the group, it is likely doing so by exploiting these preexisting smuggling networks. Q: And what about American interests in the country? A: The United States has a parochial interest in fighting al-Qaida in the Arabian Peninsula (AQAP), mainly because the group operates so close to Saudi Arabia. AQAP formed in Yemen in January 2009 after Al-Qaida Saudi Arabia (AQAS) was effectively chased across the border after a series of crackdowns. AQSA fused with Al-Qaida Yemen to build the group. Since AQAP’s birth, and especially after the arrest of one of its primary bomb experts, Ibrahim Hassan Tali al-Asiri, American and British counter-terrorism operatives have focused on destroying the group through a variety of measures, including drone strikes. This is in spite of other important concerns to Yemen’s human security, such as its massive water shortage. Ultimately, the White House and its allies are confusing tactics for strategy. International actors, including Saudi Arabia, have substituted drone strikes and bombing campaigns for a comprehensive program that could help develop Yemen in a democratic and egalitarian manner. Indeed, Yemen is simply being attacked. Without any real vision beyond that, it seems obvious that the country will continue to deteriorate, unless foreign forces either radically overhaul their approach or are forced to leave by a national liberation movement. The latter would prove detrimental to American interests in the long run. Furthermore, the level of violence being used in Yemen right now is arguably intended to prevent a revolutionary arrangement that has a chance of spreading to the Gulf monarchies, and unravelling the entire regional order. The experts then get thanked, and go home to prepare for their next appearance. It is also currently fashionable to ask Yemen experts about Sunni-Shi’i rivalries, superimposed on a wider contest between Saudi Arabia and Iran. We have to remember that Yemen is a country where, historically, neither sect had been particularly antagonistic toward the other. Indeed, Saudi Arabia supported a Zaidi Shi’i Imamate during the North Yemeni Civil War. Saleh helped disseminate Sunni Wahhabism. Sectarianism is a recent phenomenon, and the result of three factors: 1) the regional consequences of American-led actions in Iraq; 2) Saudi-disseminated doctrines of Sunni supremacy; and 3) the tendency of neoliberalism to strengthen sectarian identification and lines of division. It has been a combination of military intervention, and intense processes of commodification that have produced sectarianism not only in Yemen, but in the region more broadly. This isn’t to imply that Yemen was an anti-sectarian paradise, but rather to highlight that sectarian tension in the country has resulted from tangible factors. Sectarian identification allows for access to security, as well as goods and services, in periods of domestic instability and dwindling resources. Tensions have also been prodded by violence in other areas of the region, such as in the Syrian civil war. This was not inevitable. It was the result of policy decisions by various actors present in the Middle East. The expert allows the sheer nonsense embedded in the question to go unaddressed. The difficulty of being an expert on Yemen is that it constantly demands that you repress your desire to use endless amounts of profanity. It is obvious why mainstream Western media outlets focus almost exclusively on rank sectarianism and proxy wars as an explanation for the conflict. Sectarianism neatly presents the issue as being one of Middle Eastern savagery. For viewers, it avoids a focus on the outcomes of Saudi-American policy, which is intentional, because of the ammunition such failures provide the American antiwar movement. The idea of this being a “proxy war” goes further to quell potential dissent by making it seem as though Saudi Arabia is responding to Iranian aggression, rather than launching an unprovoked war into a sovereign country in order to pursue reactionary interests. It also erases the fact that for all intents and purposes, this is a Saudi-American invasion, with Saudi Arabia serving its own interests while also deploying its military as a projection of American power. It has become obvious that relatively new regional autocrats like Saudi Arabia’s King Salman and Egypt’s Abdel Fattah el-Sisi are using the war in Yemen to legitimize their own rule. Defending the “legitimate government of Yemen” makes these leaders seem like heroes of the Arab Spring, rather than the people who obviously crushed democratic movements. Sisi and Salman are now joined by a variety of states in a similar situation. That’s how you get a regional coalition of seven monarchies and two military dictatorships defending Hadi, whose only claim to being Yemen’s legitimate ruler is a 2012 election in which he was the only candidate. The Western left’s historic silence over such a clearly oppressive situation in the country is initially baffling. After all, the full absurdity of the Middle Eastern order has been on display in Yemen for quite some time. Critical perspectives have been needed for years, in order to appreciate the full irrationality of what has been going on in the country. Indeed, there are important questions that have immediately followed the coup. How can the Houthis be simultaneously promising to implement the stipulations of the NDC and killing student protesters in Ta’iz? How can President Obama say, in reference to news about the Houthi coup that Yemen “has never been a perfect democracy or an island of stability,” all while rapidly signing off on drone strikes in the same country? However, there have also been questions that preceded it. Why were the Gulf Cooperation Countries (GCC) allowed to have such a strong role in mediating a revolutionary situation that clearly threatened them? Why do we know so little about the People’s Democratic Republic of Yemen, which may have only been superficially Marxist, but certainly no more so than countries like North Korea? And so on. The silence and lack of relevant expertise are easier to understand if we accept something about Yemen: many people don’t know about it, or even care to learn. Countries like Saudi Arabia want to keep it that way, which is part of the reason why there was far less coverage of the Yemeni Revolution as opposed to the uprisings in countries like Egypt and Tunisia. This despite the fact that the revolutionary coalition was stronger in Yemen, as seen in the remarkable makeup of the NDC, which brought together Saleh, Hadi, the Houthis, the coalition of southern separatists known as al-Hirak, the Islamist opposition group al-Islah, various leaders of civil society, and others. Historically, there has been an enforced discursive isolation of the country, which in part explains Yemen’s relative marginalization in Middle Eastern studies. The measure of the US policy should not be graded against the success or stability of the Yemeni government, that’s a separate enterprise. The goal of US policy toward Yemen has never been to try to build a Jeffersonian democracy there. The goal of US policy in Yemen is to make sure that Yemen cannot be a safe haven that extremists can use to attack the West and to attack the United States. How are we supposed to respond to such a statement? We can highlight its irrationality, but we also have to remember that Earnest is not lying when he describes US policy this way. Washington only pays attention to Yemen at all because of AQAP. It doesn’t really care what happens as long as the United States and its allies have free reign in killing “terrorists,” and preventing revolutionary instability from spreading to Saudi Arabia and the rest of the Gulf monarchies. The depressing reality is that Earnest and Obama face so little domestic opposition for not caring that they can openly use phrases like “never been to try to build a Jeffersonian democracy there” and “never been an island of stability.” This is a direct result of the fact that we’re supposed to not care about the country, which allows for naked projections of military strength. The situation isn’t hopeless, though, and the task for the American antiwar movement is to combat this narrative and build support for Yemeni self-determination in both state institutions and public life. Broadly, though, we have to remember that the solution is a Yemeni one. There is currently massive external pressure from the Saudi-led coalition, and internal pressure from Houthi expansion, and dwindling resources as a result of wartime economic pressures. It appears that as foreign intervention intensifies, and the domestic political situation continues to deteriorate, Yemenis may be forced to form a new revolutionary coalition to forcibly expel international forces. After this is accomplished, Yemen will need to be governed by a national reconciliation government that can implement the NDC protocols, and set to work achieving the ethical and material demands of the 2011 uprising. There is room for the Houthis in such an arrangement, since the group has already pledged to form a new government and implement the NDC conclusions. However, its behavior in this conflict has further alienated segments of the population that already distrusted it because of its military strength and sectarian rhetoric. Despite this, Yemeni political allegiances can change quickly, owing to how political actors are accustomed to relative autonomy from the state and the fact that political loyalties are usually weaker in authoritarian settings. This is apparent in how other revolutionary groups have responded to the Houthis. 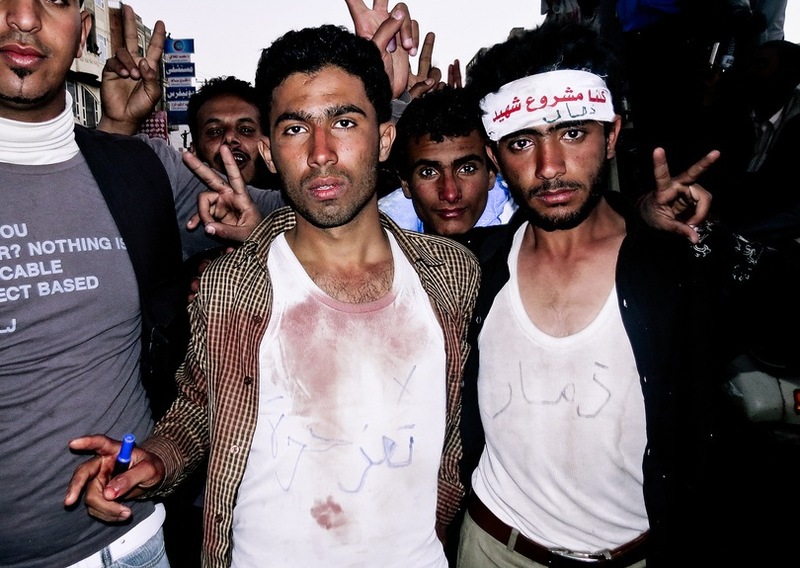 Some groups joined or were willing to tolerate the Houthis, as was apparent in revolutionary youth helping to supervise checkpoints and command posts. Others mobilized against the Houthis immediately. When the group marched into Ta’iz, it was greeted by fierce demonstrations. It is difficult to predict what happens next, and how the Houthis will act as a revolutionary force in Yemen over the next decade. Yes, it is tempting to say that people hate the Houthis too much to ever work with them. However, we are also in the middle of a war where the most bizarre alliance has been between Saleh and the Houthis, who were working out of mutual self-interest despite having decades of animosity between them. Saleh has since sought refuge in the GCC, although this may be a part of another power play. It could ultimately be Khaled Bahah, the former ambassador and recently appointed prime minister, who breaks the impasse. The hopeful thing about Yemen is that it has an endless capacity to surprise its observers. Simply put, we should do what we can, hang tight, and see what happens. Bilal Zenab Ahmed is a graduate student at SOAS, University of London, and is associate editor of Souciant magazine.